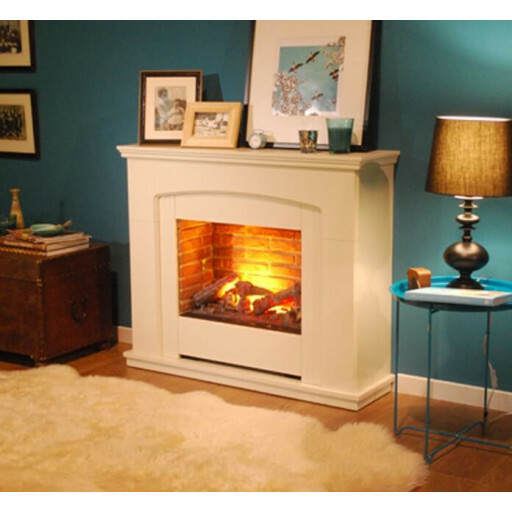 The Dimplex Alameda combines a sophisticated electric fire with an attractive mantel. It utilises top-notch technology and is constructed using the highest quality materials. You can quickly warm up a room with its powerful heater. Separate controls make it possible to enjoy real smoke effect flames even when you don't need heat. The Alameda's Opti-myst system creates "smoke" and flames that closely resemble a real fire. You may precisely adjust their intensity to suit your preferences. A beautiful stone-patterned panel surrounds the fire. To match your home's decor, you can leave the brick-style rear panel in place or remove it if you desire a matte black surface. This fireplace suite's heater is entirely hidden from view. Depending on the heat setting, it can provide 1kW or 2kW of heat. The integrated fan rapidly distributes warm air throughout the room. There's no need to get up and push buttons repeatedly. The fireplace suite features a convenient thermostat and comes with a remote control as standard. The Dimplex Alameda electric suite authentically replicates the experience of watching a fire without the hassles of burning wood. Owners also gain a safe, nearly instantaneous source of heat. Furthermore, this well-crafted fireplace suite features a tasteful design that complements the existing style of almost any room. Bought this for my elderly father who has a small flat and just needed a small electric fireplace to replace his existing one,this is perfect for him and I was able to fit it for him.